The Dependaplast Washproof Plasters Refill Box is the perfect backup essentials to ensure that your British Standard 8599-1 workplace first aid kit always stays fully stocked. The waterproof plasters are made from a lightweight, conformable material which makes it performing everyday tasks simple and non-restrictive. All of the plasters contain a special contact pad that has been created to not to adhere to the wounded area, but offering it cushioning protection and optimal absorption of exude. The ventilated materials made up from the plasters ensures that the skin is able to breath in order to quicken the natural healing process. The plasters' adhesive is made from zinc oxide, which ensures that they will stick securely in place once applied to the skin. However, they still come off cleanly so that there is no harm to wounds or any unsightly plaster marks left behind. Each Washproof Plaster is individually wrapped to maintain cleanliness, and the materials are made from low allergy, latex-free adhesive, making it suitable to use on all skin types. The plasters are packaged in a handy dispenser box, and requires a minimum purchase of five boxes per order. With 100 plasters per box, this will ensure that you will have lots of spare stock for your workplace kits. These packs are ideal to store in the Large Workplace First Aid Kit. Picture illustrates a box of 40, however please be assured that boxes of 100 plasters will be included in your order. 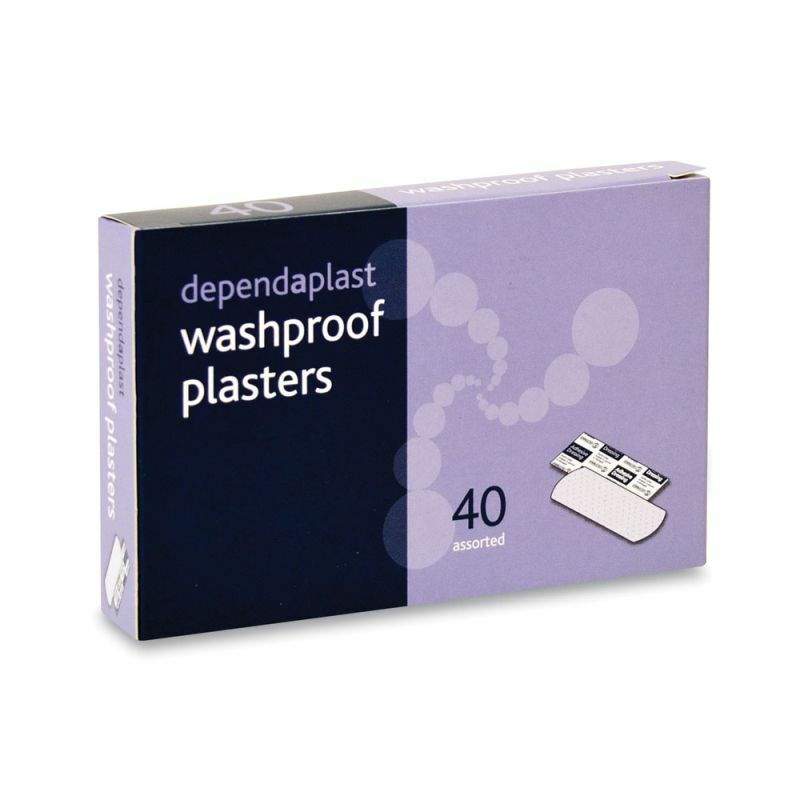 The Dependaplast Washproof Plasters Refill Box is usually dispatched via First Class Royal Mail and delivery should be within 1 to 3 working days.